If you’re guilty of punctuating your texts and instant messages with emojis, you’re not alone, affirm Tata Communications’ chief human resources officer, Aadesh Goyal, and VP of corporate communications and brand, Kathryn Partridge. Here’s how colloquial media is changing communication habits at work. They say a picture is worth a thousand words. This may be why users the world over have embraced emojis with such enthusiasm. If you’re guilty of punctuating your texts and instant messages with emojis, you’re not alone. According to a study by Swyft Media, 74% of people in the US regularly use emojis in their communication, using an average of 96 emojis every day. Since they were first invented in Japan in the 1990s, the emoji has been ubiquitous in our written communication with friends, family and increasingly in the workplace. Emojis have gone beyond a Millennial messaging fad and is considered by many the first language born of the digital age. As companies adapt to attract the new generation of workers, they are exploring new methods of workplace communication such as Slack, Skype for Business, Skype Teams and Cisco WebEx Teams, which have emojis at the heart of their platforms. 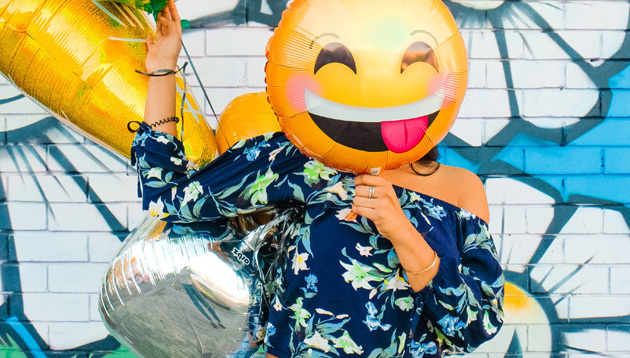 Emojis have changed the way that we communicate in our personal lives, but they are also central to how we build our work relationships and create a culture fitting of the Millennial workforce. Emotional contagion and mimicry are core to how we show empathy and build relationships. Typically, online we don’t have the ability to have this interaction, but according to research, when we look at a smiling emoji online, it activates the same parts of our brain that it would if we were looking at a real human face. As a new generation of workers begin defining their company culture, we are seeing a shift away from the view that smiley emojis ‘imply incompetence’. It can trigger a change in mood and we sometimes even alter our facial expressions to match the emotion of the emoji. The ability to develop deeper relationships with people who we don’t regularly meet with is especially valuable for individuals who work remotely, or work with colleagues who are situated in various corners of the globe. There has long been debate about the use of emojis in the workplace, but as a new generation of workers begin defining their company culture, we are seeing a shift away from the view that smiley emojis ‘imply incompetence’ for example. There are also some defined benefits of diversifying your communication through emoji use, there is evidence that emojis improve collaboration as early as the mid-90s. Researchers from the New Mexico State University conducted a study in 1996 in which the gave two groups of 12 a task to solve together, communicating via computers. One had the option to use emoticons, the other was left with text only. The experiment found that 10 of the 12 participants chose to use emoticons when offered and overall that group enjoyed the process more than the non-emoticon team. Slack, for example, allows you to ‘react’ to posts by your colleagues with a huge range of emojis. Many of the popular co-working tools on the market offer a range of emojis to enable employees to express themselves. Slack, for example, allows you to ‘react’ to posts by your colleagues with a huge range of emojis, and even gives you the capability to create and upload new emojis for your team, while Skype and Teams also includes a range of emojis. The way we communicate at work continues to evolve to adapt to our changing workplace behaviour. For example, our increased connectivity has led us to carrying our work and personal lives with us wherever we go through our mobile. Today, many workers maintain communication with their colleagues and clients through messaging applications such as WhatsApp and WeChat outside of the office. As we look ahead, it will be interesting to see how other forms of colloquial media, such as GIFs and memes permeate our communication in the workplace, but for now if one this is for certain it’s that our changing communications habits are here to say and for now, the emoji continues to be king.